The use of barbed sutures for constructing an anastomosis is favoured by a few bariatric surgeons as compared to conventional sutures. 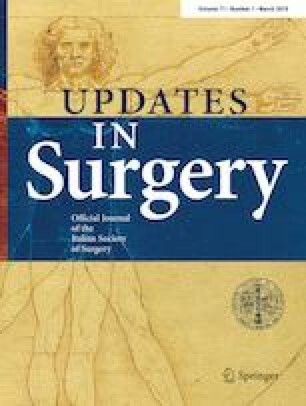 The aim of this study is to assess safety and efficacy of barbed sutures to close the gastric pouch–jejunal anastomosis (GPJA) in laparoscopic gastric bypass (Roux-en-Y gastric bypass—RYGB, and One-Anastomosis gastric bypass—OAGB) using propensity score-matching (PSM) analysis. A retrospective analysis of patients who underwent primary laparoscopic gastric bypasses between January 2012 and December 2017 was performed. Patients were divided into two different groups (RYGB-G and OAGB-G). PSM analysis was performed to minimize patient selection bias between the two types of sutures (barbed—BS and conventional—CS) in each group. A total of 808 patients were reviewed. After PSM, 488 (244 BS vs 244 CS) patients in RYGB-G and 48 in OAGB-G (24 BS vs 24 CS) patients were compared. Median operative time was significantly shorter (p < 0.001) for BS in RYGB-G. In OAGB-G, BS were associated with a shorter operative time, although no significant difference was observed (p = 0.183). Post-operative hospital stay was significantly shorter for BS in both the groups (p < 0.001). Post-operative 30th-day complications were comparable: no leakage or bleeding of GPJA was observed in BS groups. At median follow-up of 28.78 months, no late complications were observed. Barbed sutures appear to be effective to close GPJA during gastric bypass and as safe as conventional suture. Further studies are necessary to draw definitive conclusions. This work has been presented, as e-poster, at 26th International Congress of the EAES, LONDON-30 May-1 June 2018 and will be presented as oral communication at the Congress of Italian Society of Surgery on next October. All authors mentioned in this study do not have any competing interest. This specific report does not endorse any specific Company. Informed consent was obtained from all individual participants for whom identifying information is included in this article.